My family thinks I’m odd. 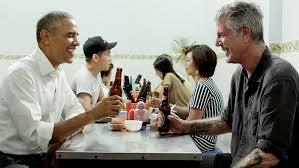 When we went to Hanoi, Vietnam in 2016, I was obsessed with going to the hole in the wall restuarant that Anthony Bourdain and President Obama ate at together. Their visit was still fresh so there were huge pictures on the wall of them and a buzz around the place. I found the table that my two favorite people in the world sat at and ordered the same meal. It was one of the most amazing moments of my life. Everyone who has chosen the international life has a story about what inspired them to live overseas. For me, it was a combination of never feeling like I fit into my American suburban surroundings, an emotion that quickly dissipated once I joined the Peace Corps and spent three years in rural West Africa. I had, at last, found my people. Peace Corps Volunteers became my tribe, my compatriots, my soul mates. And I never turned back. Anthony Bourdain personified that feeling and put into words and pictures the emotions I often experienced living in the world and in coming into contact with different cultures. I am deeply saddened by his passing because he was my muse, my “keep it real,” my connection to what it really means to live this life of travel, culture and people. His shows were a poetic composition of life, his message one of humanity, love and good times, free of pretension, racism, and commercialism. He was a constant reminder of why I do what I do. (Even on the darkest days). My family often make fun of me because when we go on vacations I make an effort to (as they like to say) “wander into the village to talk to the local people.” They laugh, but this has put me in people’s kitchens from Ireland to Istanbul and given me a picture on life that not only puts my work in perspective but allows me to feel that connection to humanity and purpose that Tony Bourdain so eloquently described every week. He once said upon accepting a Peabody Award that he asks three simple questions on the show: “What makes you happy?” “What do you like to eat?” What do you like to cook?” And the rest took care of itself. It was an approach to understanding people and culture that was so simple that it has served as a constant reminder as to why I do what I do in international education. But we’ve made it so complicated. Many of us in international education work in places that have large gates, security, and little to no connection to the surrounding community. From our sports competitions to our arts and academics to the food, we live and work in little bubbles that don’t resemble anything other than their own sanitized entity. We claim that we are preparing people to be global citizens through things like the IB and a variety of languages and international days and so on, but in large we have become so risk averse, so predictable, and so standardized that we are becoming the complete antithesis of what we aspired people to be when we chose the international life. “International mindedness” has become an air-conditioned simulation through laptops, I-Pads and high stakes grueling exams. Does the kid who achieved a 45 on the IB or a perfect 5 on and AP exam know how to ride the local bus or order a plate of chili crab in Hokkien? Well it’s not a smooth transition. And it shouldn’t be. He reminded me that while there were inherent risks in life and getting to know other people, that they were often risks worth taking. He inspired me to shake things up when they needed to be, to make connections to the local maintenance workers, the cooks, the cleaners and to get a real understanding of the international life. One of my cherished memories of my time in Singapore took place last Sunday night, for example, when I was invited to the Hindu wedding of one of our IT guys whom I had taken the time to get to know. The looks on the faces of the other workers when I arrived at the wedding was something I’ll never forget. That’s what Tony inspired in me and that’s why I work in international schools. Farewell Tony, I’m really, really going to miss you. This entry was posted in Stephen Dexter and tagged anthony bourdain, cultural literacy, international community, international education, international mindedness, parts unknown. Bookmark the permalink.